Industry has awakened to the fact that engineering drawings, contracts, corporation records, insurance policies, building plans, checks, correspondence and hundreds of other irreplaceable documents are vulnerable to bombing raids, especially to the fires which inevitably follow. Recorded on microfilm, instead of perishable paper, these valuable records may be stored in fireproof and bombproof vaults for an indefinite period in about one or two percent of the space they formerly occupied. About 400,000 films a day are exposed for this purpose. The Army and Navy, with the cooperation of postal authorities, are microfilming the mail of service men. The “V-mail” letters are filmed so that millions can be shipped in a few packing cases to faraway lands where the messages are printed just like photographs on thick paper, folded into half the original size, and distributed to men hungry for word from home. Huge numbers of microfilms are being used for this patriotic task. Newspapers are hurriedly microfilming their back files, museums are copying their works of art, hospitals are photographing X-ray plates, libraries are pre- serving their volumes. And spies and propaganda agents are having a field day, thanks to the mighty midgets of the photographic world. The Chinese, always an ingenious people, have matched America’s V-mail with what is called bee-mail, a clever spy system based on the fact that a bee will return to its hive as long as the queen reigns. During most of the war with the Japanese, the Chinese have been on the retreat because of their lack of mechanized equipment and combat supplies. As their lines move backward, their spies capture a number of bees from a farmer’s backyard, carrying them in tiny cages. Microfilming their messages and printing them on very thin paper, they attach the paper to the bees and release them. The bees wing their way back to the hive at a speed of 30 to 40 miles an hour just as efficiently for short distances as homing pigeons which are employed in the same manner. The message is picked up at the hive. This system works both ways across the lines. Most of the atrocity and propaganda articles which filter mysteriously out of conquered nations like Poland to see the light of day in American newspapers are transmitted to this country by refugees who have concealed microfilms around their persons and baggage, or by spies who turn them over to allied agents in neutral nations like Switzerland or Portugal. 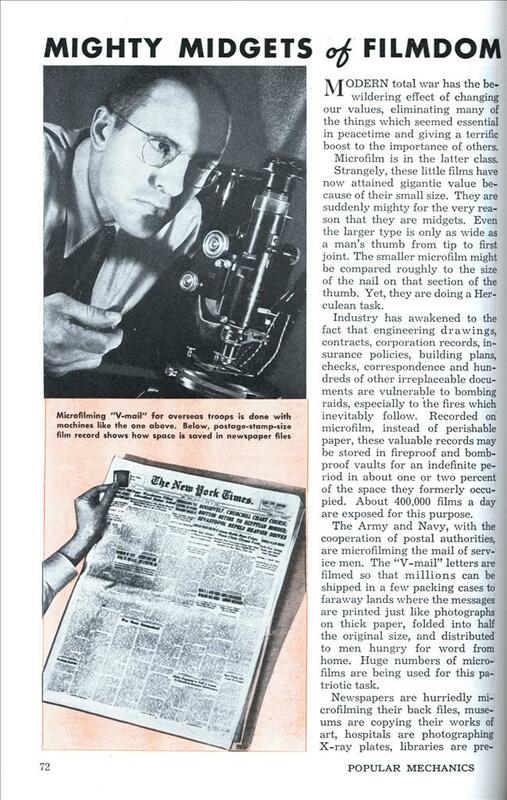 A single microfilm will easily transmit from 5,000 to 10,000 words of information printed in fine type. Many of the anti-Nazi publications which continue to circulate in a wide underground network throughout Europe are read in the form of small photographic prints from microfilm, or are enlarged and published in hideaways from articles transmitted by microfilm. As in the case of the Chinese and the bee hives, this use of microfilm works both ways, to get facts into the United States and to get them smuggled out. Nearly every important spy trial since America entered the war has revealed that Nazi and Japanese spies are making full use of microfilm. In one case a hidden movie camera caught the spies in the act of operating with the mighty midgets. In this case, too, the small size of microfilms is the key to their value. The little fellows certainly lend themselves to concealment. One popular method of transmitting spy messages is to pry up the sole of a shoe, particularly if it is rubber, slip the film in and let the sole fall back into place. Fountain pen caps will hold a microfilm and the pen, too. Trimmed down, microfilms are concealed beneath a postage stamp. The new style filter pipe in which the stem fits over the interior section where pipe and stem join, is helping spies. Microfilms are slipped between rows of matches in a paper match container. No one notices if a spy discards an apparently empty paper match container, or hands it to an assistant. In addition, microfilms may be hidden in the nose, in seams of clothing, in a woman’s coiffure and they are even slipped into capsules, usually of silver, and swallowed. They fit nicely in the back of watch cases and in one instance a trapped Nazi spy was found to have bleached a microfilm and substituted it for a lens in his eye glasses, indicating that the Germans have a process which will restore the message on the bleached film. But they have more respectable war purposes, too. In cases where one war plant wishes to farm out contracts for intricate mechanical parts to a number of other concerns, the objects themselves or the detailed plans are being microfilmed and shipped by air mail. At the receiving end, these pictures are enlarged and scanned in a reader, or photographic prints are made. Weeks of delay are avoided. A tiny spot can be blown up as big as a door mat. They are valuable for the making of templates, when not too large, for the metal may be coated with sensitive emulsion and the pattern printed right on the plate. Testing airplanes has been speeded up along with experimental flying to discover the efficiency of various types of plane de- sign and equipment. It has been standard practice for a test pilot to make a flight in the morning with a pad of paper and a pencil on his knee for notes. He spent the rest of the day calculating what his instruments recorded and preparing his data for other tests the next day. Now a microfilm camera goes aloft with him, constantly recording the facts told by his instruments as he concentrates on flying the plane. On landing, he is able to scan records within an hour or two and then take the craft aloft for additional tests. New uses crop up constantly. The state of New York recently destroyed 7,000,000 canceled checks, filming them so that the record was just as good with a saving of 99 percent of the storage space. Draft numbers are always microfilmed so that they show the date and time they were drawn to establish the proper order. The famous Westinghouse time capsule, buried deep under the site of the New York World’s Fair for the benefit of future generations, contained microfilm records which will give a complete picture of contemporary civilization. One great newspaper, the New York Times, microfilms its pages daily and readers may subscribe for the film edition, which is mailed to them. Another, the Philadelphia Inquirer, keeps its back files in this manner and even supplies a Philadelphia library with copies so that anyone can search for an item with a microfilm reader which throws the type into clear enlargement. This is far simpler and easier than thumbing through hundreds of pages in a bulky volume which soon wears out. The editions for an entire month occupy little more space than a bar of soap. Tiny films were used as far back as 1870, during the Franco-Prussian war, to fly messages out of besieged Paris by tieing them to the legs of pigeons. However, it is only during recent years, and particularly in the last few months that the business of microfilming has boomed. This volume concerns itself principally with the haste of business concerns to protect their records from bombing and, possibly, sabotage by fire. A number of new companies have sprung up because of this available business, also a number of theories about the best methods of microfilming. These theories deal largely with the size of the film, whether they should be filed in strips or rolls, and type of equipment. One of the leaders is the Microstat Corporation of Norwalk, Conn., founded by V. E. Pratt, a former advertising man. After he retired from business, he set up a workshop in his barn in Silvermine, Conn., and in 1938 completed the first model of his microstat camera which takes pictures, enlarges, prints and projects them. Now, microfilming trucks of his company thread the highways across the nation. His instruments are completely motor controlled. They will separate lines packed together as closely as 3,000 to the inch. Their focus is calibrated accurately to .00025 of an inch. They make duplicates on transparent paper, photo-sensitized tracing cloth and transparent acetate. A whole book can be condensed on a dozen inches of film. In addition to this device, the Pratt company has developed a six-pound film reader. Although it is so small it can be carried in a suitcase, it can hold a million pages of material copied on microfilm. Among his other inventions which will be produced for sale after the war are a teledex reader to replace the cumbersome big city telephone book, and an optigraph reader which will make books easier to read. Another leader is the Recordak Company of New York City, an affiliate of the Eastman Kodak Company. On its equipment, records can be condensed to about one percent of their volume. A 100-foot strip of 16-mm. film will reproduce 2,352 letters or 4,812 filing cards. The film is stored in a carton 4 by 4 by 1 inch. Copies of books can be microfilmed as fast as the pages can be turned. Bank checks can be recorded at a rate of 140 a minute. 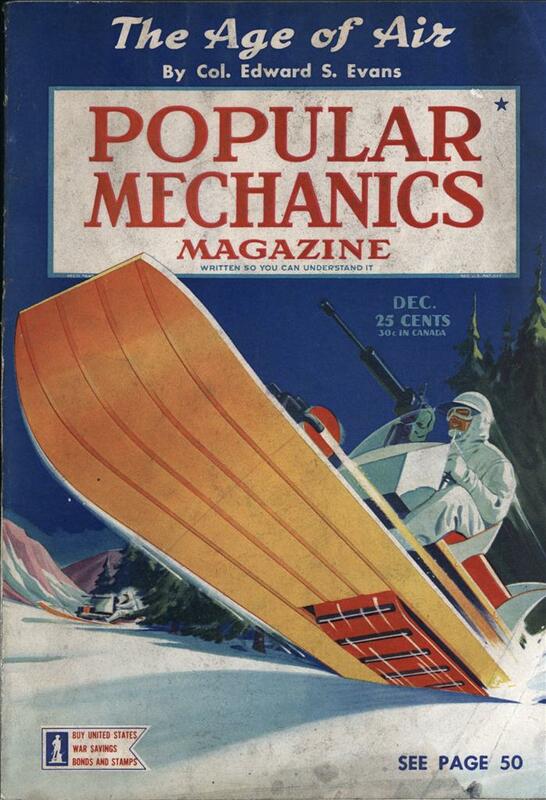 On its machines, 1,600 pounds of V-mail can be reduced to less than 15 pounds, which indicates the approach of trans-Atlantic airmail in volume. Aside from microfilming, its big brother, photocopying, is performing much the same commercial function. The principal difference is in the size of film used, the larger film having advantages and disadvantages, according to the job. All types of film, most of which were developed by Du Pont and Eastman Kodak, are fire and water resistant acetate and will “keep” for generations if properly stored. These mighty midgets are booming business right now and it looks like an attractive field for an ambitious man, but the truth is that machines are rarely sold since it is almost impossible to obtain the materials essential to their manufacture. Instead, microfilming has tended to become a service, operated by experts. Later on it will probably be different. The boom is not likely to end with the termination of the war. Microfilms, in postwar jobs may be as important as the mighty midgets in “uniforms” are today. The nice thing about microfilm is that its man readabe, if you squint. Hiro: I had to do some research once that involved looking up microfilm copies of “L’Evangiline” newspaper. It looked like it was copied on Tri-X. Man readable? Yeah, if said man had a projector. To make matters worse, the ancient microfilm reader that could handle that format had an even worse ‘negative photostat’ hardcopy device that printed undersized shiny-paper light-sensitive streaky smelly black/white-reversed image. One became adept at sprinting down to the main photocopier to make a stable copy – negative imaged again to end up with a positive, if possible. Microfilm and microfiche has proven itself as a very stable and long lasting archive medium. All that’s needed to view it is some form of magnifying device. That’s what “man readable” means. Data rot is very common with digital media. 70 years from now, I don’t know if anyone will be able to view a DVD or CD. The device to read it may be very hard to find. There is a good chance that the data itself my be gone too. Most digital archiving is still being put on tape. 20 years ago, VHS was ubiquitous. Most people have tossed their players. It’s not that easy to find a player in someone’s home today. What about an 8mm film projector?